Fact One: I plan to live to be ninety-six years old, give or take a couple. That’s three years fewer than my grandfather lived (who didn’t smoke or drink, who ate oatmeal every morning, and who didn’t retire until he was almost ninety). But ninety-six is ten years longer than my mother lived (who didn’t smoke or drink, and who ate oatmeal every morning). And it’s seventeen years longer than my father lived (. . . well, yes . . . but seventy-nine years was a respectable run, considering). Fact Two: The other day, just as I pulled into my garage, the odometer in my beautiful little red Honda “Fit” turned over to 68,000 miles. Stay with me here – these facts are related. Fact Three: Earlier in the week a Honda mechanic told me that his friend has a “Fit” with 200,000 miles on it. Sitting there, admiring those three zeros on the odometer, I turned off the car radio and started doing the math. I’ve had my car for eight years; 68,000 miles is less than 9000 miles per year. I’m seventy-four, and if I continue to drive the same number of miles per year, the car in which I was now cogitating could last till nearly my ninetieth birthday. If I drive fewer miles in the coming years (which is likely), and this wonderful, reliable red car makes it to 200,000 miles (which is possible) . . . this car may serve me for the REST OF MY LIFE. This may be the LAST car I ever own! Suddenly I felt an unexpected surge of mixed emotions. There was a spate of panic, seeing the end of my life racing down the highway of my imagination, headed straight for me. And there was a wash of relief that I may never have to go through the agony of buying a new car again (unless I decide I just HAVE to have an electric car, or even a self-driving car – red, of course). And then there was a mélange of little feelings: new fondness for my reliable car, self-congratulation that I had chosen this particular four-wheeled companion, amazement that life itself doesn’t come equipped with seatbelts, and half a dozen other unnamed feelings. Right there in my garage, there was a sweet, brief love-fest: just me and my little red car. Together. Maybe forever. I’m further along than you, Cynthia, and I have been driving my stick-shift 1994 BMW321i for twenty years. It takes curves gracefully, slows when I let up on the gas, responds immediately. It’s a delight to drive except in stop-and-go traffic. And it is old. The end is coming. Occasionally I go out and it won’t start. Then Roger fixes it and tells me a new car isn’t nearly as much fun to drive, excursions to the grocery won’t be a test of skill. He’s right. There’s no replacement. I celebrated my 80th birthday last month. I still drive the speed limit, but with more focus, making up for that possible diminution of skill. With luck the self-driving car will arrive before the Beamer dies. Then I won’t have to recognize my own degradation and will be able to use trip time to read instead of driving. And Beamer will be my last car. I love the thoughtfulness in your response! And I love your reasons for not replacing the Beamer – FUN has got to be a major component of aging, or we might as well quit life entirely. So here’s to life, to birthdays, to fun, to the cars that serve as major metaphors for our culture – and to friends who share six decades of history! Can I ever identify with this, dear Cynthia! As of last week, my sweet Corolla had 255,000 miles on it and I had no intention of “giving it up”, until my daughters said that the fumes (they smelled, but I didn’t) were weakening my memory and probably shortening my life! No need to mess with the distributor cap, they know how to get to me. So now I have a new used Corolla with only 33K on it and I can talk to the steering wheel…AND I remember everything! By the way, she still needs a name: something 2 syllables and lots of fun (color: barcelona red). I welcome suggestions! Thank you for your wonderful essays! Well, if it’s “barcelona red” it ought, perhaps, to have a Spanish wine name. How about “Abona”? You might consider adding a glass of Mogan David concord wine with wheat germ added as your bedtime cocktail. Grandfather did that every night (did you know?) Although he hid the bottle in a shoe box so the good Methodists wouldn’t find it. And he drove that monster cadillac till he was 90 something… Scary ride that was. As a Jew from the South and being required to ingest Mogen David on a somewhat weekly basis, I can attest to the fact it is not wine. Not sure what it is, but it is definitely not wine. Thinking of it as medicine is probably a better way to categorize it; maybe good as cough syrup or to sooth a sore throat. Perhaps we need to explain to other readers that your comment is in response to my cousin Mary’s and my comments – see further back in this string! Thanks for your perspective, Allan – I know it’s kosher wine, but no matter how many rabbis supervise its production, that stuff is still disgusting! I love it – I’ve been thinking the same thing – my car is almost 6 yrs old, has 20K miles on it – will it be my last car? When will I be forced to stop driving? Will someone please tell me now where the alternator cap is so I don’t have to go thru the “Mom shouldn’t drive anymore” battle! I absolutely approve of pro-active aging – i.e., where is the distributor cap in an engine (that’s what’s surreptitiously removed when “Mom shouldn’t drive anymore”). So google that sucker now. Then at least you can look under the hood and know if it’s missing! If it is, then call your favorite mechanic (whom you’ve been buttering up for years, in preparation for this moment) and get him to replace it. THEN have the conversation with the offspring, to find a compromise solution when the playing field is a little more level. Elders unite! Great idea! I’d probably need county approval for a special easement, or whatever it would have to be. We know that these kinds of things take a while to work their way through the channels of bureaucracy, so maybe I should start the permitting process now . . . do you think it should be above or below the septic field??? Oh Starr, I’m so glad that encounter ended well. Please continue to be safe. It’s not really a companion car unless you name it! Just sayin…. Just as soon as she tells me what her name is, I’ll call her that. Now that she’s begun to boss me around about writing, maybe she’ll finally let me in on that little secret. What a wonderful piece, Cynthia, both in the ideas and in the words! Thanks, Johnny. As a scientist you would have laughed (kindly, of course) to see me trying to figure out the numbers for this piece! That was so fun and meaningful to read. I often think how many more miles do I have in me. I just went through the painful process of buying a newer car. This will truly be my last car, and she is a very sweet girl (misty blue/gray) We are going to enjoy these last miles together. Blessings on both of you – don’t forget to pat her on the hood from time and time and tell her you love her. You’ll both get better mileage that way. I love it! I’m smiling and you did it!!! What a writer and observer of life you are! When I bought my brand new VW Golf in 2000, I said it would be my last car. I’ve now outlived all the women in my family and my car, like me, is old! 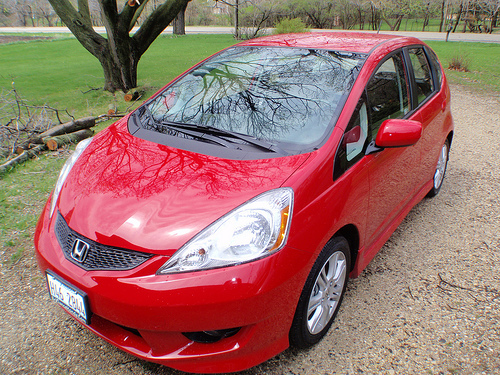 BUT, I’ve been eying the little Honda FIt and do want to return to being a Honda owner. My previous car was a Honda Civic and I loved that car! So when my VW dumps me sometime down the road, I might just join the Honda Fit Club. Keep up the wonderful writing. And here all along you’ve thought that time at the Athletic Club was the way to be Fit! Let me know when it’s time to break a champagne bottle over the prow of a new car! May you and your car be Fit for a full 200,000 miles! Thank you for such sweet and hopeful visions at a time of such disruption. So many blessings! It seems as if lately not only my book is telling me what to write and where to speak, but now my car is bossing me around about blog posts as well! I wonder whether the 96th birthday or the 200,000 mile celebration will come first? Whichever, you’re invited to the celebration of the fulfillment of optimism! I love this! I, too, have been thinking of my final car. I have a VW Golf with one of those diesel engines that defy the emissions testers. If the timing works as planned, I will leave the island and sell my car back to VW as part of their penance for deceiving the public, government, and possibly assorted dieties. In England, where I am moving, hopefully within a year, I will have no car; happy to be able to use public transportation at very low cost (actually free) as an old age pensioner. So, this is my final car, too..and I am only 68. Wow! Good choices, Glo. Except that we’ll miss you. It’s a good thing that you’ll always be a part of the Whidbey Island family, no matter where you are. Wonderful sentiments, dear Cynthia! 96, eh! May that happen with grace and I look forward to celebrating it with you. Great, ’cause I may need help in blowing out all those candles!